I have no idea how to start this blog post. Know the feeling? The lead is the most challenging part of any text for me. I have been writing for living for 16 years, and still, it happens to me weekly: I have no idea how to get started. Most writers know the phenomena of writer’s block: the inability to express oneself with words. How do you start? How do you get the text flowing? I have nothing to say! Everything I write is awful. Who says you have to nail down the beginning first? No-one! You can start anywhere from the text. I personally tend to start from the part that is the clearest for me, and often it’s not the beginning. Start from where you know what to say and let it grow from there. Sometimes it helps me to get my ideas on the paper, even though they are not very refined yet. In those moments, I list the main point of every paragraph or text passage. Another method that works for me is writing everything I want to say, in any which order. Once everything is out in the open, I start rewriting the text. And rewriting and rewriting. So don’t fool yourself: any good text has never been written in one go. If you‘re more of an auditory person, why not speak into a recorder and let an app transcribe your thoughts into text? When I write using source material, I highlight all the points I want in my text. Once I’ve dealt with them, I remove the highlight – this allows me to see clearly that I’ve advanced. It also helps me figure out which parts are the most important. This technique also works with the previous tips: you can use highlights in your first draft to help you see which parts are the best. 30-60 minutes at a time can be enough. 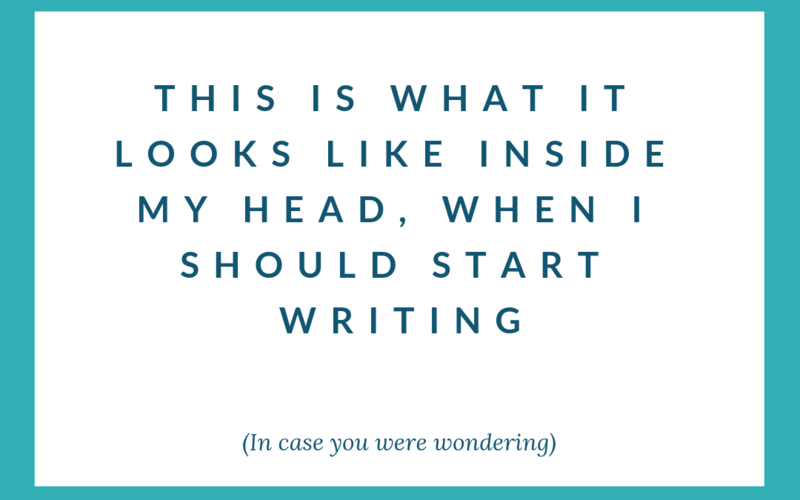 Of course, you need to be honest with yourself: if you see you’re pushing the writing back by doing all the laundry and cleaning the windows, you’re not attacking writer’s block, you’re procrastinating. After all,, everybody has their own preferred method. I know writers who could not imagine writing a first draft and then starting over – they want every paragraph to be perfect before moving on to the next. And then there are others who can’t get anything done in one hour and want to stick to their text for hours and days straight. So this is my last tip: respect your process. Respect what you know works for you. Sometimes brilliant writing just needs time. Do you have a method that always helps you overcome writer’s block? Or am I maybe the only one experiencing it at all?